As a parent of two young children (1 and 3 years old) I strive to foster a creative imagination and a spirit of adventure in my wee ones. Not only do I believe this will become a great asset for them as they grow, but it also means that as a time-poor, energy-sapped, sleep-deprived, cash-strapped parent, it provides me with an adventure ‘fix’ of my own. There’s also something quite satisfying about creating adventures out of very little. It makes them feel, somehow, more wholesome; more real. The age of my children means that the world is both enormous and tiny all at the same time. Their minds are amazed at the scale, size and extent of landscapes, trees, lochs, ideas, possibilities. Yet, they are equally obsessed by minute details. Leaves, beetles, puddles and stones can hold a world of wonder and their attention. It is here that I believe we, as parents, can play an important role in the shaping of adventurous, imaginative, creative minds. In fact, I’d argue it’s a parent’s responsibility to do so. 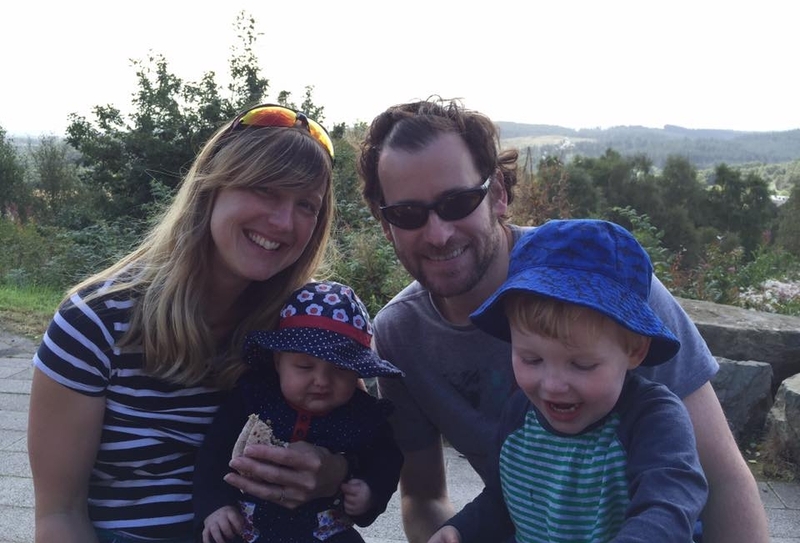 In my experience of having children, the nature of what becomes an adventure has changed. The prospect of my partner and me having a child-free weekend to run a mountain marathon or undertake a mountain bothy adventure is as likely to happen as finding hen’s teeth! The reality is we will be having no child-free weekends for a long time to come. Yes, this may be a hard one to accept when that reality finally bites, but give it a little bit of time and you start to realise that adventure can be had in different ways. Adventure doesn’t just have to be about trekking across a desert or scaling a Himalayan peak, but can be a walk in the woods, a torchlit crawl through your living room or making up stories that bring the world of adventure to anywhere. Adventure is a mindset. The best things about a mindset are that they are free; don’t require any equipment and they can be had anywhere, any time, no matter where you live or what your circumstances might be. This is the beauty of what I call ‘Tiny Adventures’. Everyone can do tiny. Call me old fashioned, but our children wouldn’t know what to do with an iPad. They do, however, love to look at books and to hear stories. So, put down the iPads and get to your local library. I have found an amazing range of children’s books that are about all kinds of adventures hiding in the shelves. My imagination used to come alive when the mobile library visited our school and, even now, I can still recall the sense of excitement and wonder from the pictures of sinking ships, treasure hidden in secret coves and camps in the middle of the jungle. If you can’t get to a library, then just create a story using your imagination. I have made up countless adventures involving a troll and a goblin. Not only do our children love hearing these stories and stories from books, but they provide the basis for re-enacting them when we’re playing. No garden? No woodlands nearby? It’s raining (being in Scotland I know this all too well!)? Then make an indoor den. You’ll be amazed by what a few sheets, blankets and cushions can become. We’ve been on the North Face of Everest with the winds howling outside. We’ve been the victim of a Yeti attack (a.k.a. a one year old pulling the den down!). We’ve been in pirate ships, camped on desert islands and hidden from dinosaurs. Your imagination really is the only limit to what an indoor den can be. (Tired parents note that indoor dens can also double-up as TV-watching hides for those days when it all is just a bit too much. Just be careful of your precious cup of coffee, though, it’s no fun when the ‘Yeti’ knocks that over! If you’ve got a garden, use it for adventure. We’re lucky in that we have a garden in which we inherited a small, weeping tree. Its shape lent itself to having an opening chopped into it and it has now become our ‘Gruffalo Den’ for hiding, outdoor story time and chasing around. As a hoarder of DIY materials, I discovered that by refusing to see a huge pile of wooden off-cuts go to landfill I was able to make a very basic ‘fort’. It has 4 posts and 3 sides, with a large hole cut into one side to make a doorway. It took about an hour to put together; super-simple! The fort has now become the place where outdoor ‘meals’ are rustled up by our in-house, 3 year old chef, and where attacks on the Gruffalo Den can be hatched. I totally get many people don’t have spare wood, trees or consider themselves to be ‘handy’ when it comes to DIY. But it’s the principle, the adventure mindset. Seeing your garden as if you were 3 years old is all that’s required. Got lots of shrubs and bushes? Then you could be in a dense forest. Just got grass? Then you could be in the Prairies of Canada or ice sheets of Antarctica. Only got paving slabs? Then perhaps you could be on the Moon or in the desert (if it’s a hot summer’s day). Nothing more than gravel? Then maybe you’re on a beach or the ocean floor. Any garden can become an adventure garden. When it’s dark, or during the winter months, make the darkness a reason for adventure. Use a torch or the light on your phone to light the way along the street or on the path into the woods. Shine the light into gardens, up streets, into puddles, up trees, anything you can find. Young children will love it and you can pretend you’re on a mission to find treasure. You can even bring this type of dark adventure indoors. Close the curtains, switch off the lights and grab your torch. Get down on the floor and crawl as slowly and quietly as possible from room-to-room, as you carry out a secret mission. Not sure about camping with children? No problem, start in your garden if you have one, or indoors if you don’t. That’s right, put your tent up in your living room, just don’t peg it into the floor! Use the adventure to get your children used to sleeping under canvas and all being huddled in together, but with the security of knowing you have all the necessities for the children to hand if you need them. Whether you choose to camp indoors or out, it can become your next Tiny Adventure. So, will you be on the ice shelf of the Antarctic, Everest Base Camp or in the Amazon Rainforest?